This week at Dreamforce 2013, the Developer Relations group launched an entire library of books, workbook tutorials, and cheat sheets, along with hands-on workshops and a new Salesforce1 Quick Start to get developers going with Salesforce1, Force.com, Heroku, ExactTarget and other platform technologies. With the help of a virtual army of technical writers, editors, product managers, technical evangelists and Salesforce MVPs, we launched seven new books this week including five Salesforce1 titles. The foundation of the series, the Salesforce1 Admin Guide and Salesforce1 Developer Guide, walk admins and developers through setting up Salesforce1, creating and customizing apps to run in Salesforce1 mobile app, building Visualforce pages, mobile cards and flexipages that are optimized for the mobile experience, creating custom Publisher Actions and more. However, it was the Salesforce1 API Guide, which covers not only Force.com APIs like Force.com REST and Force.com SOAP APIs, but APIs from ExactTarget, Heroku, Pardot and others that was the most requested book of the week. In fact, the API Guide covers a breadth of Salesforce1 APIs and provides use cases to place them in context. As Dan Appleman noted in the acknowledgements of Advanced Apex, I may have “strong armed” him into writing a second edition of his popular book, but for a good cause–Advanced Apex Second Edition by Dan Appleman now includes new chapters with updates throughout the book to cover new features introduced in Winter ’14. Finally, Force.com Fundamentals, the core book for learning how to develop Force.com applications was popular amongst attendees. Most of these books can be immediately downloaded as HTML or interactive PDF at http://developer.salesforce.com. You can find our books at http://wiki.developerforce.com/page/Force.com_Books. 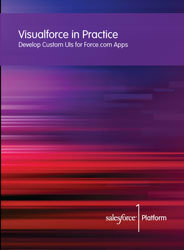 Workbook tutorials like the Force.com workbook, Apex Workbook and Visualforce Workbook have all been staples for developers learning to build Force.com apps. These tutorial-style workbooks, which take anywhere from five to fifteen minutes to run through, walk you through building a complete inventory system called the Warehouse App while giving you hands-on experience with key platform features. Other new workbooks include the Heroku Workbook that creates a simple Ruby app, then shows how that app can connect to Force.com using OAuth authentication, and pull down Contacts data from an Account object. Also, new is the Analytics Workbook, which was popular with declarative developers and the Security Workbook. All workbooks are available online at http://developer.force.com/workbooks. Cheatsheets in the Devzone were so popular that developers grabbed nearly all we had in stock. Currently we have 13 Cheat Sheets: Salesforce1 Admin Cheat Sheet, Salesforce1 Developer Cheat Sheet, Apex Code Cheat Sheet, Visualforce Cheat Sheet, Force.com REST API Cheat Sheet, Force.com SOAP API Cheat Sheet, Git Cheat Sheet, Chatter SOAP API Cheat Sheets, Chatter REST API Cheat Sheet, Formulas Cheat Sheet, Security Cheat Sheet for Administrators and the Query & Search Optimization Cheat Sheet. We will be adding a new Canvas Cheat Sheet soon. Cheat Sheets can be found online at http://developer.force.com/cheatsheets. Finally, don’t forget to check out our feature articles by top Salesforce developers and MVPs at http://developer.force.com/content/type/Article, and our weekly blogs from the Engineering and Developer Relations teams at http://developer.salesforce.com/blogs.